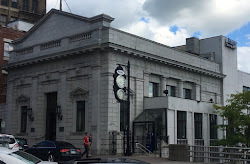 Jeff For Banks: Bank Deals: How Are They Working Out for You? Bank Deals: How Are They Working Out for You? Bank mergers are picking up steam. Technological change, regulation, and scale are cited most often by sellers. Take a premium now, rather than drift slowly into the abyss of irrelevance. 'I've yet to see an investment banker quantify this all-important math when he is presenting a stock-for stock deal to the board of a potential acquirer. Instead, the banker's focus will be on describing "customary" premiums-to-market-price that are currently being paid for acquisitions - an absolutely asinine way to evaluate the attractiveness of an acquisition - or whether the deal will increase the acquirer's earnings-per-share (which in itself should be far from determinative). In striving to achieve the desired per-share number, a panting CEO and his "helpers" will often conjure up fanciful "synergies." (As a director of 19 companies over the years, I've never heard of "dis-synergies" mentioned, though I've witnessed plenty of these once deals have closed.) Post mortems of acquisitions, in which reality is honestly compared to the original projections, are rare in American boardrooms. The should instead be standard practice." How can Warren's words be put into practice? To exemplify, I took two of the largest acquisitions in 2011 to back-check if it improved the buying bank's EPS and efficiency ratio. I went back over three years because mergers should be considered and executed with long-term financial improvement and overall bank strategy in the forefront of the "should we buy" decision. Citing the first few "clean" quarters after closing the transaction perpetuates the short-term budgeting culture that plagues our industry and prohibits long-term investing. By looking three plus years after merger announcement, I avoid that self defeating game. I didn't take the largest deals from 2011, which were: Capital One Financial/ING Bank ($9.0B), PNC/RBC Bank (USA) ($3.5B), and Comerica/Sterling Bancshares ($1.0B). These transactions were so large, and two were foreign banks selling US subs, that it doesn't relate to my readers. But the next two deals in the table certainly relate. Both deals look like they improved the buyer's EPS, with People's United achieving a 10.8% annual growth rate and Susquehanna achieving an even better 19.9%. People's efficiency ratio, a measure of how much in operating expenses it takes to generate a dollar of revenue, went down slightly. Achieving economies of scale should drive down the efficiency ratio. Although People's decline in this ratio was small, the relative size of Danvers ($2.6B) was only 10% of People's size ($25.0B) at the time the deal was announced. Susquehanna's efficiency ratio went up. This is counter-intuitive, especially since Tower's relative size ($2.6B) was more significant to Susquehanna's ($14.2B) at the time of announcement. One would think that realizing the necessary cost savings to justify paying a premium would result in a lower efficiency ratio. Susquehanna was unable to achieve this "economy of scale". 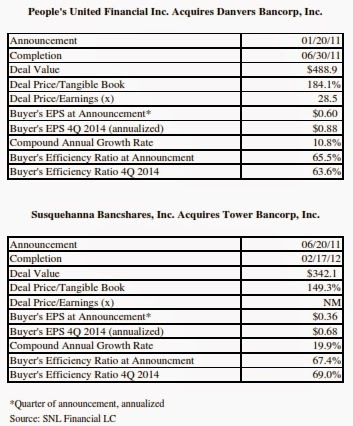 It is also worth mentioning that Susquehanna's earnings were sub-par at the time they announced the Tower deal. They had a 0.32% ROA at announcement. Not something to include in the shareholders' letter. Nowhere to go but up, right? People's, on the other hand, had a better ROA (0.84%) when they announced the Danvers deal than in the fourth quarter (0.74%). The primary culprit was a precipitous decline in net interest margin of 116 basis points (yikes!). The fact that their efficiency ratio went down tells me they hit their operating expenses hard. As Warren alluded to above, I bet that wasn't in their post-merger projections. I don't think it's very complicated to decide to do a transaction or not. What fits your strategy? Can you build it or must you acquire it? If an acquisition, can you afford the premium for the target so your bank is better off for having done the deal than passing? Once you land a deal, accountability should be equally uncomplicated. My firm once represented a bank that had an activist investor on the Board. All that guy wanted to talk about was the efficiency ratio. Very one dimensional. But I digress. He did hold management accountable for achieving the cost savings in the projections. So management prepared a spreadsheet of the phase-in of cost savings and the overall cost structure of the combined bank once all synergies were achieved. It wasn't a very complicated spreadsheet, and also gave management some leeway to alter where things were cut, so long as they achieved their aggregate numbers. At the end of your strategic measurement period post-acquisition, the value of your bank (intrinsic value mentioned by Warren) should be greater for having done the deal than if you went it alone. If People's and Susquehanna could not achieve the earnings growth in the table above, then doing those deals improved their value. If each could have achieved those numbers on their own, and there are reasons to believe they could have, then why do the deal at all? Is it a fair question?